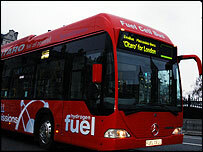 Plans to make bus travel in London free for the under 16s are to be scrutinised by a transport watchdog. The London Transport Users' Committee (LTUC) say the move may discourage walking, increase anti-social behaviour and cause over-crowding on buses. Mayor Ken Livingstone hopes to offer under 16s free travel by September. TFL said the measure was to "encourage lifelong habits of using public transport and reduce reliance on the private car". Ken Livingstone said: "This was a clear and high-profile manifesto commitment, endorsed by Londoners at the mayoral election. "It was one of my key pledges to Londoners during the election campaign and I am pleased that we are making such rapid progress in its implementation." The LTUC, which represents the interests of transport users in the capital, launched the inquiry on Friday. They said a committee will look at all issues concerning children on buses, including road safety, effects on the school-run, health and other modes of transport. Brian Cooke of the LTUC said given recent bus fare rises and investment in transport "it does seem odd to spend £60m giving free travel to teenagers, who may not need it, and who can often walk."